Well I’m just back from another trip to London for the Allergy and Free From Show 2013. The trip provided a great opportunity to find some new gluten free suppliers, stock up with products from some old favourites, eat out at some of my favourite London restaurants and meet up with fellow coeliac Twitter friends. We’d had such a fantastic time last year that I was really looking forward to it. Like last year we decided to make a few days of it in London, as it’s quite a trek from Plymouth. This year we stayed at a Premier Inn at Earl’s Court which worked out really well. The hotel was right next to Earl’s Court tube station which was served by the Picadilly and District lines so made getting around London really easy. It was only a mile from Olympia so we able to walk to the show too. Saturday and of course the main event! After a 20 minute walk from our hotel we got to Olympia and thought they must have been hosting a rock concert at the same time. The doors were not yet open and the queues were massive. 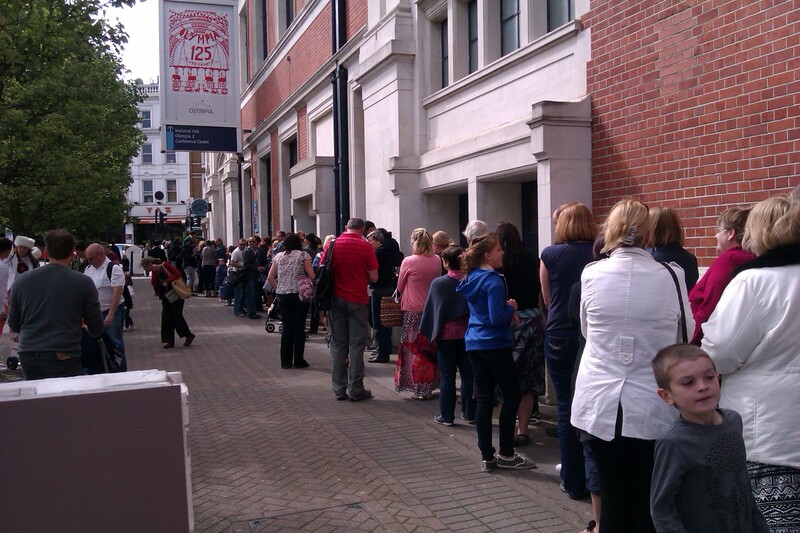 The picture shows part of the queue, and it was the same around the corner and shortly after behind us too. The queues cleared fairly rapidly once the doors opened and before we knew it we had picked up our goodie bags and programs and were inside. This year the event had moved to the larger National Hall due to the previous years success. This year there were over 200 stands to visit. First stop (where else?) was to visit friends Ann and Steve on the Perkier stand. I’d met these guys at a couple of previous tweet ups in London and they are a lovely couple, and their products have such amazing branding. Happily their produc ts are great too and I am a big fan of their brownies, rocky road and popping tiffin. Whilst I’m not a porridge fan, their breakfast treat has also featured on Gluten Free by the Sea previously. I got to try their bread for the first time and it was fantastic. The closest gluten free bread I’ve tried to the real thing to date, and I bought a loaf to take home. I was also lucky enough to win the final Perkier goodie bag on the day too! We stumbled upon the Venice Bakery UK stand pretty soon after. 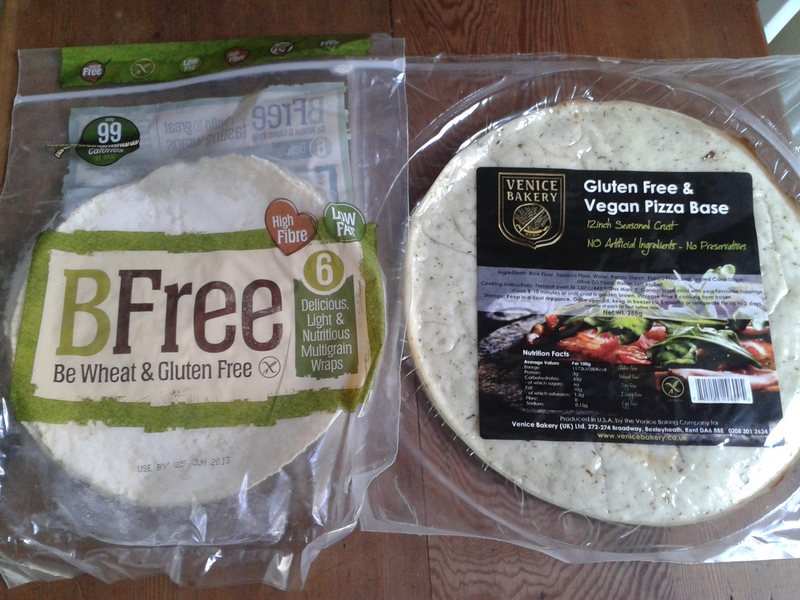 I’d heard lots of good comments about these products recently, but must admit when I read they were gluten, wheat, dairy, soy and egg free as well as being vegan I was a little sceptical about how good these could really be. We tasted a fair few pizzas at the show, but this was the best by a long distance for me. The base had great flavour and the texture was superb. Pleasantly soft but with a good crunch on the outside. The large bases are pricey, usually two for £7, but we happily picked up two for £5 which was the offer price for the show. They also had smaller bases and flat breads available. Certainly one to watch. 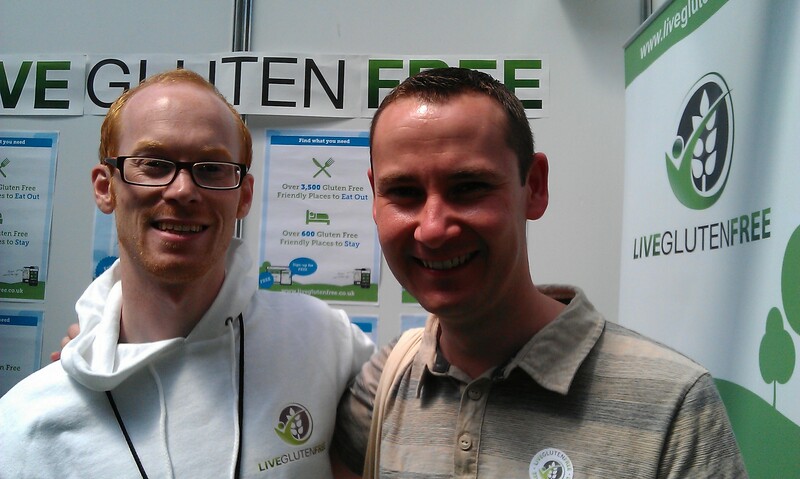 I was also eager to try the wraps from BFree, an Irish company who are shortly to start selling their wraps at ASDA. These were very impressive and I bought a couple of packs to take home. Whilst slightly smaller than the Newburn Bakehouse wraps, they do have six in a pack for £3. I think I actually slightly preferred them to the Newburn version. Again we bought a couple packs to take home, and like last year the bags were suddenly getting a bit heavy within the first hour! 11am came which gave a chance to have a sit down in the cafe area during a planned meet up with some coeliac Twitter friends. For me this is one of the great reasons for going to a show like this. There are so many people on Twitter I “speak” to on an almost daily basis, it’s brilliant to have a chance to have a chat in person. It was lovely both to catch up with some familiar faces and also meet some new ones. An hour passed all too quickly though and I didn’t really have time to chat to everyone properly, so sorry for the ones I didn’t really get to speak too. Brilliant to see you all in any case. Back to the shopping and it was good to see Devon represented by Clive’s Pies and Tideford Organics. I first discovered Clive’s at last years allergy show and have been a regular eater since. This was the first time I had got to try the Tideford products though and I will certainly be seeking them out again. I tried a minestrone soup made with GF pasta, which was a previous pre-coeliac favourite of mine. I think this is possibly the first time I’ve had it since being diagnosed and it was fantastic. The flavour of the soup was great and I can’t wait to try some more of the range. Another company which I think we will see big things from this year is ilumi world. These guys are giving some heavy promotion to their free from ready meals at the moment, and I have to say I’ve been very impressed with the ones I’ve tasted so far. They are offering £10 off orders over £20 during June and I think I will be stocking up based on the products I’ve tasted so far. I got to try a few of their products at the show and came away with a sample of Spanish rice and vegetables which was very tasty, with all natural ingredients. The beauty of these meals is they do need even need to be refrigerated. A great thing this year was seeing friends working on the stalls too. 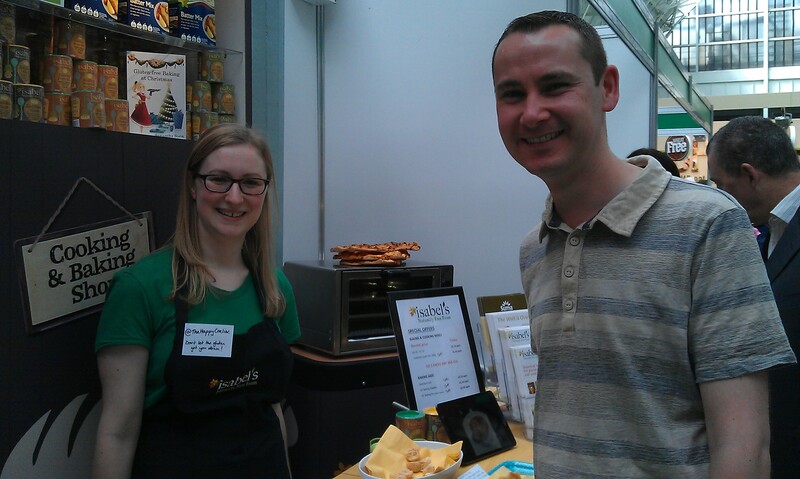 As well as the Perkier guys, it was also nice to see Sam (The Happy Coeliac) working on the Isabel’s stand. It was also good to meet up with a few that I’ve long time Tweeted but never met before. 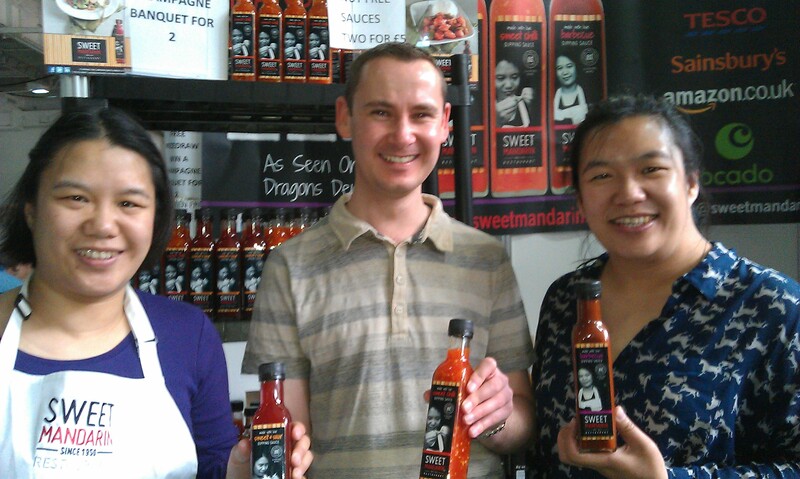 These included the guys from Live Gluten Free, CELIA Lager and the lovely Helen and Lisa from Sweet Mandarin. It was interesting that CELIA have removed the prominent “gluten free” wording from the front of their bottles due to suppliers saying some people have been put off, though the crossed grain symbol remains for all coeliacs to see. Also great to catch up with Alex Gazzola on the Skin Matters stand, a true gent as always! It was really good to see Caroline of The Free From Bakehouse again, especially as she was selling Lemon Meringue Tarts which were nothing short of sensational, I wish I’d have bought more. At this point the show was getting busy, really busy! It was getting quite hard to move around without being buffeted which I could live with, but my real frustration came from not really being able to get to the store holders as they were just being mobbed. I gave up trying to get to a few of the stands and from seeing other people’s Tweets I think I missed quite a few of the producers as a result. I think in hindsight we should have gone on the Friday when it was a bit quieter, but we had plans to meet friends and I’d have hated to have missed the Tweet-up. I think next year though I’ll definitely be aiming for the Friday to help preserve our sanity! One slight concern I had was the proximity of the V Delicious show. Apparently there were different coloured stand hoardings and carpets to mark the different shows, but I have to say I didn’t notice these. We went to one stand right next to the allergy show and were offered a taste of a chutney on a gluten free oat cracker. However the spoon being used to serve up was also being used to spread on spelt bread. A lucky escape which we made them aware of, and we hope others were not caught out. It wasn’t until checking the program afterwards that I realised this company wasn’t actually exhibiting at the free from show at all. Overall though I really enjoyed the show and it’s so good being able to walk around and indulge in so many gluten free treats, meet old friends and find new tasty products. I will definitely be going back next year. After a quick rest stop at the hotel we enjoyed a gluten free pizza at Otto accompanied by a CELIA Larger before sampling some live music and a few ciders in Soho during the evening. Sunday saw a (slightly hungover) trip around the Science Museum before having some lunch before catching the train home. We decided to hit Honest Burgers again after enjoying it so much a few days before. Who knows when I’ll get my next fix? Hope to see you all at the show again next year folks. See more photos at the Gluten Free by the Sea Facebook page. Carly Talbot, David Johnstone and Kevin Gollop – Perkier Tweeps! I first stumbled (quite literally) across the Perkier pair, Ann and Steve, at the London Allergy & Free From Show last summer. Wondering aimlessly along the aisles, in awe of all the Free From foods available. I hadn’t really noticed their funky bright display; until Steve noticed my Coeliac UK sticker I was wearing and promptly beckoned me over with their tray of tasters as bait. Thank god they did. I was instantly amazed by the quality of the Brownies. A little off subject side story… Way back, when myself and the GEW (Gluten Eating Wife) were first going out, pre Coeliac Disease. We were at the Goodwood Festival Of Speed and stopped for a drink and snack from this posh mobile Coffee WW2 Army catering van. We bought the most wonderful Brownie and from that day on, we have never been able to better it. That had become the yardstick that every Brownie we’ve eaten since, had to measure up too. Nothing came close until that moment and Perkier’s Brownie’s surpassed it… and this from a Gluten Free product. Wow! 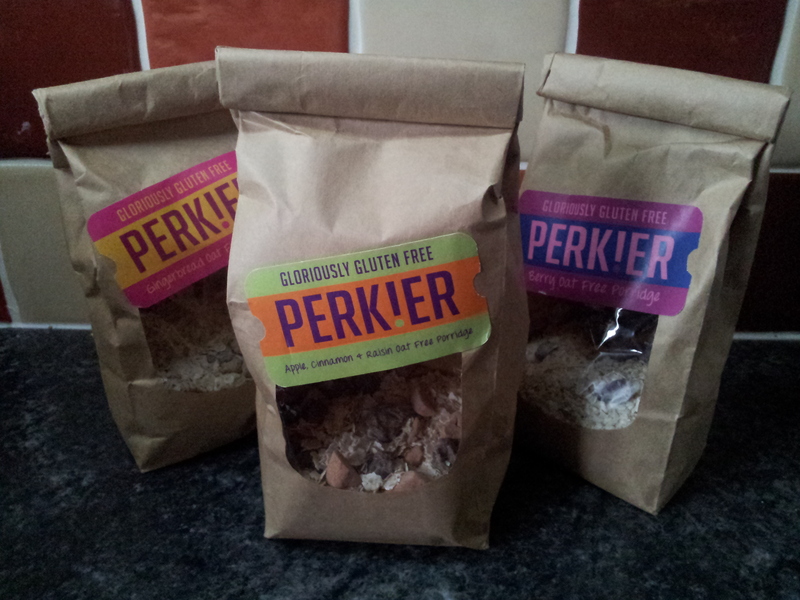 But I digress… It was obvious from the very start that Perkier are a Premium brand, built around taste and quality. Not just a poor over priced imitation of a Gluten-full product, that had come to disillusion me as a newly diagnosis Coeliac. I have followed, purchased and enjoyed their wares ever since. Its with great satisfaction that the Brand is becoming more successful. You can easily see on social media that their kitchen – the “Yummery” – is producing ever more products, filling the selves in Whole Foods Market across the country, plus still selling and posting direct. So its only natural evolution that their products will start being made outside, to meet higher demands. 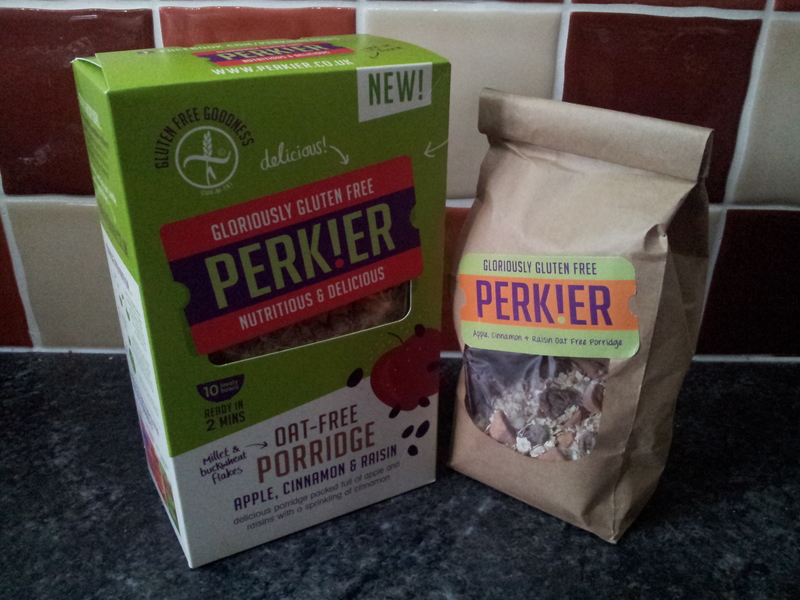 First of their range to do this, is a Selection of their Gluten Free Porridges. I have purchased their Porridges before. Either from various fairs of sent direct from The Yummery. All of which has been hand made/blended by the Perksters. 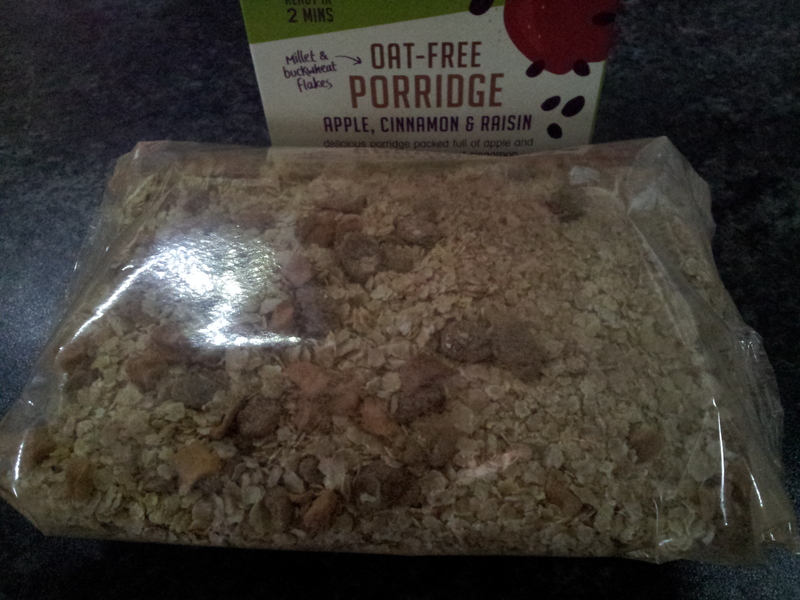 I seem to react to Oats and have really missed my porridge, so have tried the Millet variety from Holland and Barrett. I wasn’t impressed, it took forever too soften the grains and remove the sweaty fifty pence flavour to make it palatable. Not a problem with any of the Perkier Oat Free range. Their mix of Millet and Buckwheat (obviously of a higher quality that the other I’ve tried) only needs 2 minutes in the Microwave, tastes smooth and rich. Not only this, but they come in range of amazing indulgent flavours. Fruity Berry; Gingerbread (with real Perkier made Gingerbread pieces) and Apple, Cinnamon & Raisin. Making a Gluten and Oat Free breakfast a real treat. I have always thoroughly enjoyed all of these. A real Premium treat and a true Free From breakfast, makes you feel special about being a Coeliac. Ginger is one of the flavours I crave the most since being Gluten Free. The Gingerbread porridge is fantastic, the Gingerbread pieces often do not make it into the breakfast and I’m longing for a Perkier Gingerbread Man. But surprisingly my favourite porridge has become the Apple, Cinnamon and Raisin. Love the light spiciness to it and the juicy Apple pieces in the hot porridge. Luckily for me, this is the only Oat Free porridge that has gone into mass production and launched nationwide in the new packaging. And more good news, as the other two Oat Free flavours will still be made in the Yummery for direct sales. Now the concern always is… that when a food product, delightfully hand made in a “cottage style” Yummery industry like these porridges, goes on to a larger scale production through a separate partner… Will it be different, will it change from the product I’ve come to love and enjoy? The truth always is, that unfortunately it always does as it has to! But the proof is in the pudding or breakfast so to speak… so is it going to be as good??? 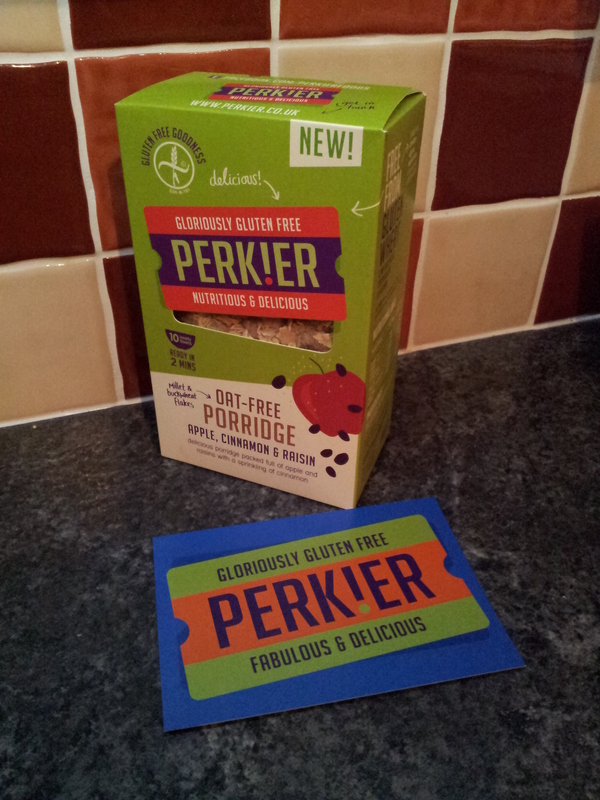 It was very exciting to receive the parcel containing the new Perkier porridge. First impressions see the new p was good. Have kept the bright distant colours that separate the brand, its really going to stand out on the shelves. Has Perkier’s mission statement, the packaging and labelling text speaks to you directly as all good Lifestyle brands should! Everything’s there to fill you with confidence about the product, including the Crossed Grain symbol loud and proud. Rather than hidden away around the back. I particularly like the fact the serving measurements had changed from weight to spoonfuls, instantly calming and humanising the experience. I made a serving it as per the box instructions; 4 heaped spoonfuls and 160ml of milk or water (I choose 50/50 water & semi skimmed milk mix, but that’s just me!). Really wanted to see how this new batch was going to compare to how I fondly remembered the original. First impressions good came out of the microwave creamy and smooth. 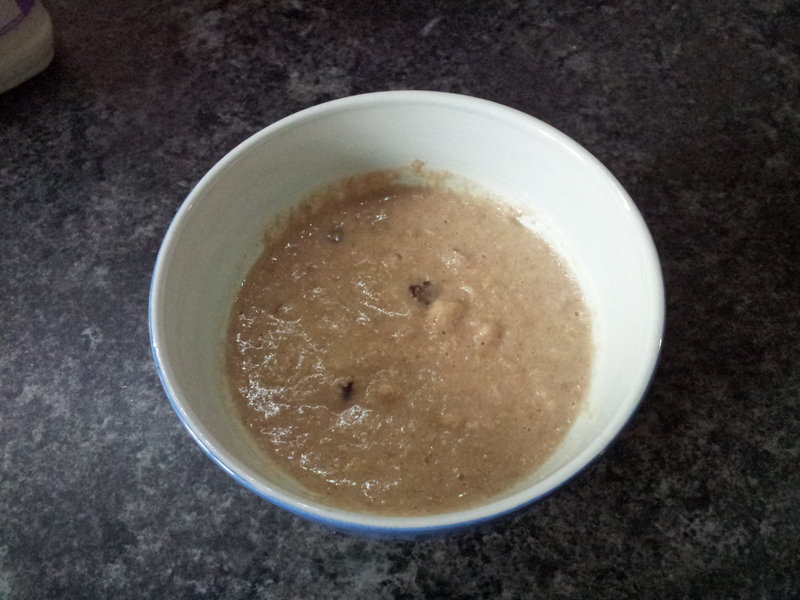 Leaving to cool for 1-minute porridge steadily continued to thicken. Perfect, I have always liked my Porridge to be served thick and smooth. 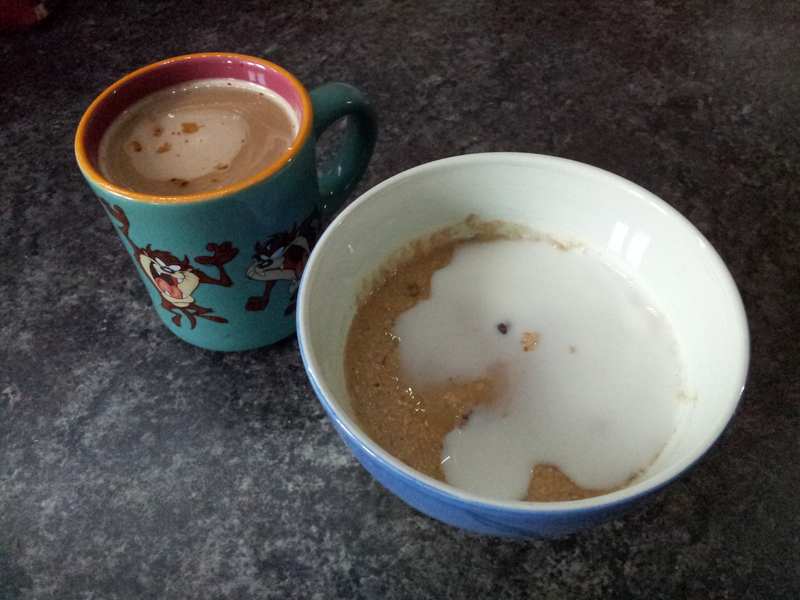 Then lightly sprinkle a small amount of sugar onto the top, allowing to melt into the porridge. Then pour cold fresh milk around the edge, allowing it to pool at the sides. Only then do I mix it all together and indulge in the warm porridge treat. It tastes great, thank goodness. In truth, this new production version of the Perkier Oat Free Porridge is a little different to the original Yummery version. I think there is a bit more Cinnamon than before and the Apple pieces are a tad smaller but still as plentiful. But in no way does it suffer or distract from the taste, I still very much enjoyed breakfast. The porridge is still smooth and nowhere was there any trace of coin flavour. At £3.99 RRP for 10 good servings, its a Premium product and priced reasonably as such. But of course as with all Perkier’s wares, they are worth it. Its not an over priced gap fill item capitalising on the Free From market. I can’t wait to see it in my local Supermarket and hopefully further Oat Free options soon. 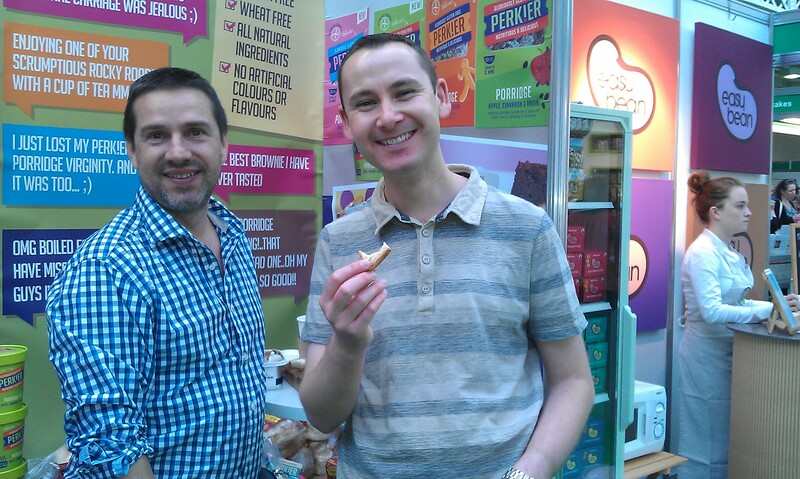 Last May I paid my first visit to the Allergy and Free from Show at London Olympia. It was a fantastic event which I thoroughly enjoyed and I am very much looking forward to going back this year. This years show will again be held at London Olympia, though slightly later than last year with the event running from Friday 7 – Sunday 9 June (2013). The good news is that Gluten Free by the Sea has teamed up with the Allergy and Free From Show to bring readers of this blog unlimited free tickets to the 2013 show in London. To apply for your tickets follow this link. At this years show there will of course be the opportunity to meet many of your favourite free from suppliers, whilst having the opportunity to meet some new faces. There will also be cooking classes in the Sainsbury’s cooking zone, free seminars and a chance to meet a range of specialist consultants, support groups and engage in workshops. New this year will be an “Allergy House” where you will be able to discover the best allergy products for your househould. 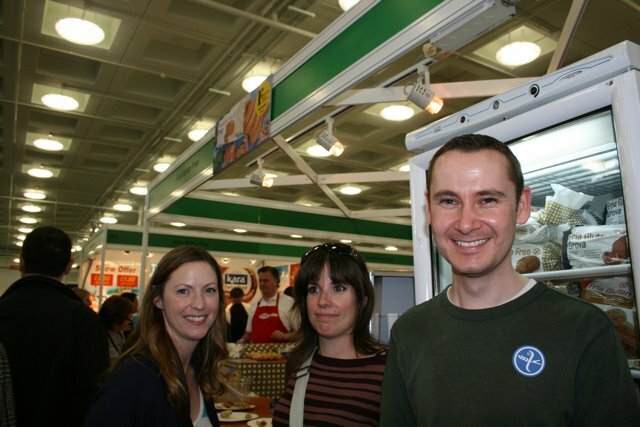 Running simultaneously at Olympia this year will be V Delicious, a vegetarian good food show. If you will also be travelling some distance to London, then it’s very much worth spending a few days in the capital exploring some of the great gluten free places to eat. For a few ideas have a read of a blog post on one of my previous trips to London here. So what are you waiting for? Grab your free tickets to the Allergy and Free From Show here and I will hopefully see you there!